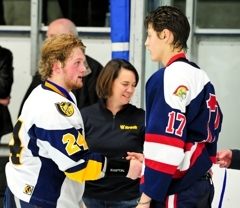 Breck senior forward David Zosel had already done his part in the Section 2A tournament. 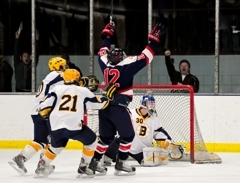 Halfway into overtime against Delano in the semifinals on Tuesday, March 1, Zosel netted the game-winning goal after wondering if he would even see the ice ever again in his high school career. This time around Breck coach Les Larson and his coaching staff made sure Zosel had no doubts about his post-regulation play. “We knew we had to get him in there,” Larson said. “We were going to do that. That was our plan all along and we did. He rose to the occasion again. 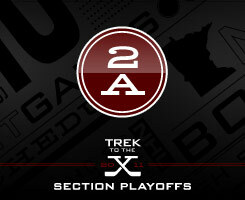 Only 59 seconds into the second overtime, Zosel punched in his second game-winning goal of the postseason sealing a 4-3 victory against Orono on Thursday, March 3, and sending Breck to its third straight state tournament. “It’s a surreal moment that cannot be described at all,” Zosel said. “It’s something that I’ll be telling my kids about for a long time. 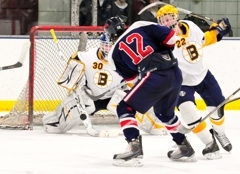 With one eight-minute overtime period already in the books, the Mustangs knew they weren’t looking for a pretty goal to win the physical game. “We knew we were going to get a little dirty one at the end,” Zosel said. “I wouldn’t call it magical. I would call it lucky. 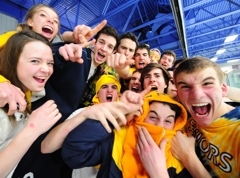 Zosel’s goal ignited the Breck fan section and not only stunned the Orono side, but Larson as well. Breck’s comeback seemed not only unlikely at times, but nearly improbably. 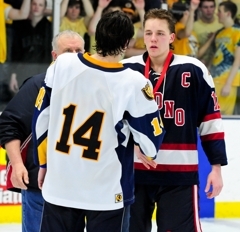 “(Orono) came out and they just mugged us,” Larson said. “They were all over us. They were winning the battles. They’re big – I’ve described them before as a football team on ice, I mean they’re tough and good, hard-working kids. They had us but we just kept working. Along with registering an assist on Keegan Iverson's goal that kicked off Breck's three-goal third period, Colford also scored the game-tying goal with 1:06 remaining in regulation. 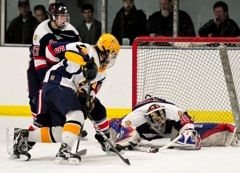 "Grant Opperman had the puck in the high slot," Colford said. "He passed it down low to me. 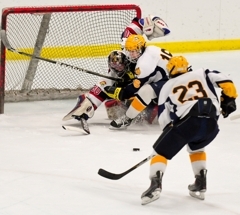 I knew the goalie was going to go down, I pulled it to my backhand, had the open net and it just went in. "I knew we had the momentum after that." 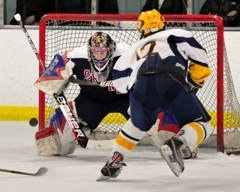 Still, the Mustangs admitted they felt some heavy pressure at times from Orono. 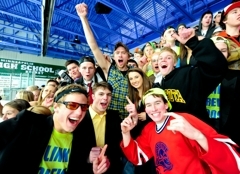 Even the Spartans’ fan section made things a little bit more difficult for Breck. Perhaps most surprising was the set game plan for victory in the game -- or lack thereof. 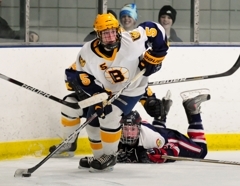 Whatever the official rotation was, Breck managed to get its overtime hero on the ice and into the right position he needed to be. That confidence, trust and maybe a little luck complete the Mustangs’ come from behind victory. 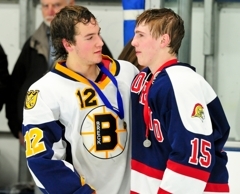 Waiting for the medal ceremony to begin following Breck’s 4-3 double overtime victory against Orono in the Section 2A championship game on Thursday, March 3, David Zosel spotted a familiar face in the crowd. 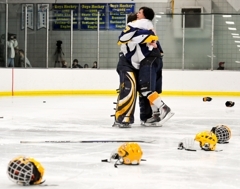 Zosel -- who had scored the game-winning goal for the Mustangs just 59 seconds in the second overtime period -- skated over towards the Breck cheering section and reached up to share his happiness with a special fan. “I said hi to Sue Andrle,” Zosel said. “Their house is right by the school. Seniors (at Breck) have ‘senior privileges’ so we can leave school during our free periods. I don’t get enough sleep at night so I go there during my free periods and sleep at her house so I can have enough energy for the games. 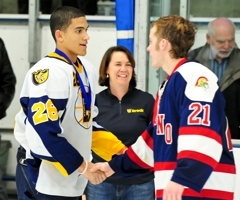 Zosel expressed his gratitude and triumph with Mrs. Andrle before accepting his medal and celebrating with his team. After losing over 10 seniors from its 2010 Class 1A state championship team, Breck’s 2011 season was heralded as a rebuilding year. 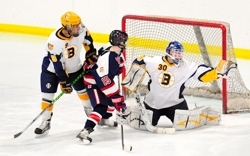 The Mustangs were not the heavy favorite to win Section 2A for a chance to defend their title. With a lot of talk about Breck’s youth, talented and experienced seniors seemed forgotten at times. 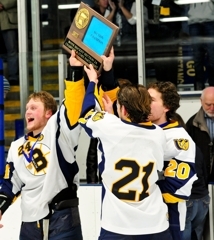 “I just tried to ignore it,” Breck senior forward David Zosel said. 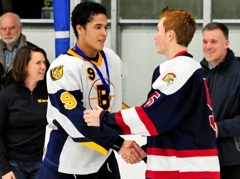 “My main goal this season was do whatever it takes to get back to state. 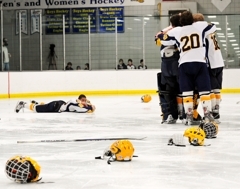 It wasn’t just those seniors who carried us last season. 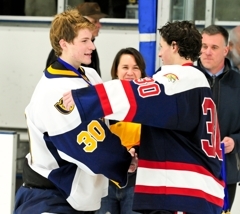 It was also Max Oppenheimer, Max McCormick, myself and all the seniors that are playing right now. 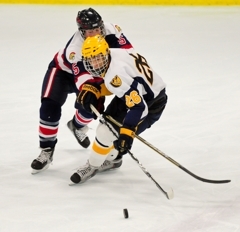 We knew we had to carry the load this season because we had a lot of young, talented forwards. 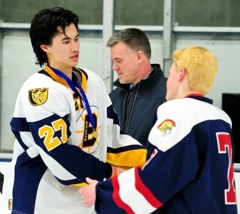 I credit Matt Colford, Jack O’Connor, Andrew Headrick and Thomas Lindstrom for stepping up. 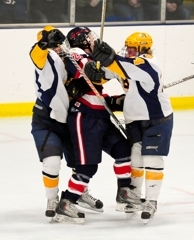 Zosel’s game-winning goal scored 59 seconds into the second overtime period of the Section 2A championship against Orono was assisted by two juniors -- Conor Andrle and Wesley Iverson. Breck coach Les Larson acknowledged he knew victories would not come easy with a younger team, but it was not impossible. “We had to work very hard,” Larson said. “We knew we had talented kids but we also knew that they were very young. 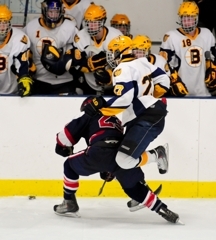 The maturity level, age-wise, from last year to this year is just like a different level of hockey mentally. Now ahead for Breck’s crafty underclassmen and experienced seniors is the Mustangs’ third straight appearance in the state tournament. “How bout that?” Larson said. “It’s an unbelievable dream to go there. Unless you’ve been there, you think you know what it’s like. It’s just the best thing in the world. The neatest thing about it is going to be able to see all these new kids who have not been there before, experience that. 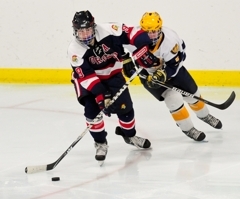 Orono played three Section 2A playoff games at Parade Ice Garden -- a quarterfinals game against Providence Academy, a semifinals game against Blake and the championship game against Breck. 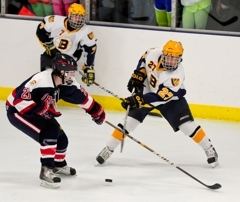 During that three game stretch, the Spartans turned heads outscoring their competition 15-9 but fell one goal short of reaching the state tournament. A tough third period sank Orono as Johnson noted the pucks weren’t bouncing the Spartans’ way as they had been in the first two periods. “We knew that they were going to get a pretty big punch in the third,” Johnson said. “It’s just a funny game. They get that one to make it 2-1 and we come right back and score to make it 3-1. We think we’re sitting pretty. Then it goes 3-2. Our kid breaks his stick, drops it, the puck lands there, he’s skating off, he happens to kick his stick which kicks the puck right to their defenseman for a goal. They made the play when they had to --they got a break and made the play. 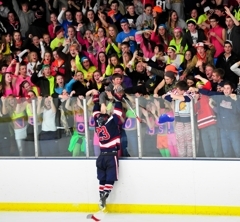 One thing that did go in Orono’s favor was stellar play by senior forward Ross Luedtke. 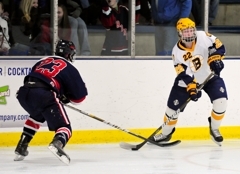 Luedtke scored his third consecutive hat trick in as many games and had 11 points (nine goals, two assists) during the Spartans’ Section 2A playoff run. Led by Luedtke, Orono kept things a little closer in this year’s matchup against Breck after losing to the Mustangs, 8-0, in the 2010 Section 2A semifinals. “We did a lot of fun things this year and had a great end here,” Johnson said. “It didn’t turn out the way we wanted it to but we can’t hang our heads. 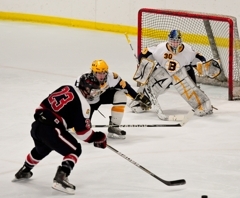 David Zosel scored 59 seconds into the second overtime of the Section 2A championship game against Orono on Thursday, March 3, to send the Mustangs to their third straight state tournament appearance. 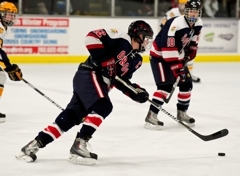 Orono senior forward Ross Luedtke notched his third hat trick in as many games as the Spartans' co-captain registered 11 points (nine goals, two assists) in the playoffs and recorded 70 total points (34 goals, 36 assists) on the year. 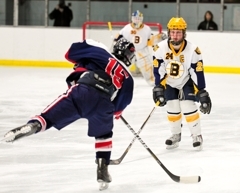 Luedtke's hat trick would not be enough as Breck scored three goals in the third period. 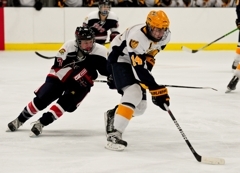 Sophomore forward Matt Colford netted the game-tying goal with 1:06 left in the third period. 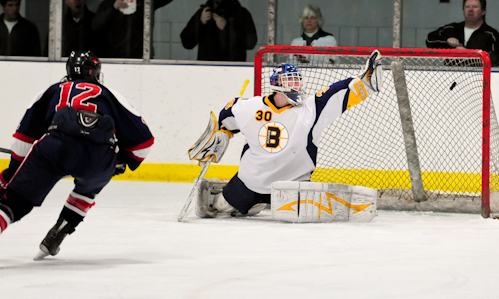 Junior goaltender Jack Kenney made 35 saves for Breck as the Mustangs improve 20-8-0. 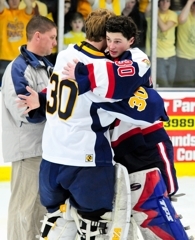 Orono goaltender Matt Peterson made 29 saves for the Spartans who end the season with a 17-10-1 record. 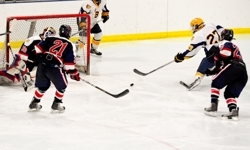 As if it wasn't enough to score the game-winning goal over Delano in the Section 2A semifinal game on Tuesday, March 1, Zosel was at it again during the section title game against Orono on Thursday, March 3. 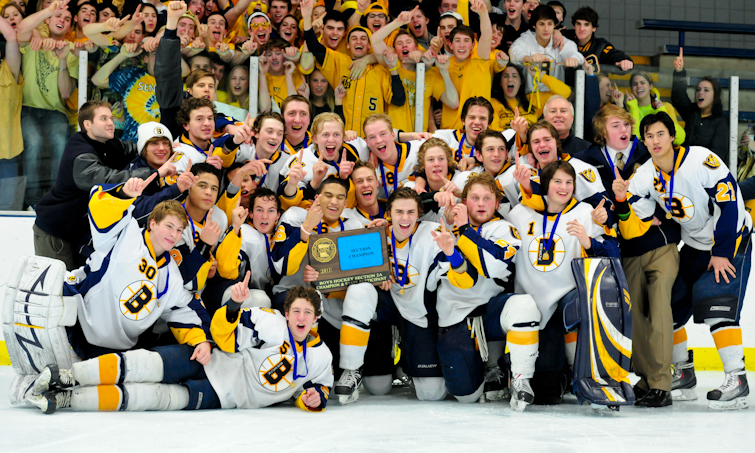 The senior forward sent the state tournament-bound Mustangs to their third straight Section 2A championship by scoring the game-winner 59 seconds into the second overtime period. While Orono's impressive playoff run came to an end on in the Section 2A championship game against Breck, Luedtke didn't make things easy for the Mustangs. The senior forward scored his third consecutive hat trick -- including a pretty, second-period breakaway goal -- finding the back of the net in each period for the Spartans. Colford assisted on Keegan Iverson's third period goal that started out the scoring for Breck and sent home the game-tying goal with 1:06 remaining in the third period. 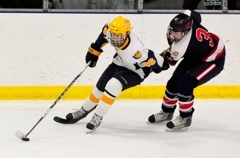 After the Mustangs had difficulty capitalizing on offense during the first two periods, the sophomore forward stepped up in the third period with two big points.